The issue No. 5 (September-October) of CIHEAM Bari Documentation Centre Newsletter has been released. In this issue, focus on: "The State of Food and Agriculture 2018. Migration, agriculture and rural development", the book of the month. In CIHEAM Bari publications library focus on “Development trends and performance of fruit and vegetable chain: analysis and opportunities of the Egyptian System”. "Gioconda's smile made in China", docufiction and interview with Antonietta Pignatelli Palladino. Latest additions to the library’s collection of books and articles: CIHEAM Bari Organic Agriculture Library and CIHEAM Bari library. FAO Repository Library: new releases. 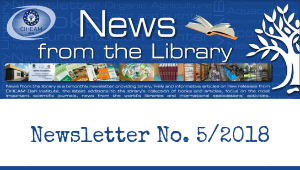 International Federation of Library Associations and Institutions (IFLA): new releases.